Given my recent return to radiofax utility station monitoring, one station I had formerly received interesting images was the BMF station in Taiwan. It was an especially memorable station as they operated at 10kW making the signal easier to receive at home compared to JMH, but also because they transmitted satellite images as well. Another memorable thing was the fact I received a QSL card from them – nor many of these stations send cards at all. As a result, this was a station I wanted to hear again. However, after scouring a number of South Korean, Japanese, Chinese, Vietnamese, Indonesian and Australian SDRs at the scheduled times – I heard precisely nothing across their frequencies. Looking online, there seemed to be considerable confusion about whether BMF was still active, as they remain listed in the NWS/NOAA Radiofax Schedules guide, although some listeners had already decided that the station was inactive without any form of confirmation. 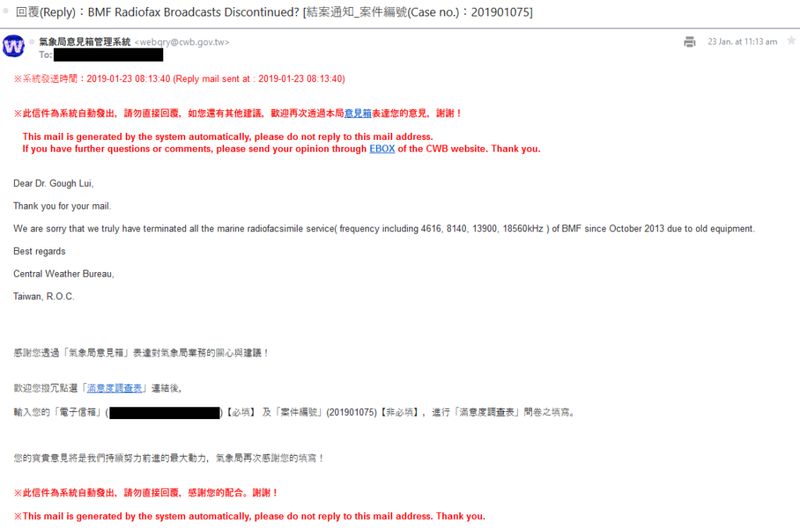 As I knew that the Central Weather Bureau was responsible for the transmission, I enquired with them directly on 20th January 2019 to determine if they were still on the air – after all, they were omitted from the WMO’s listing. Their response indicated that BMF had been terminated as of October 2013 due to “old equipment”. 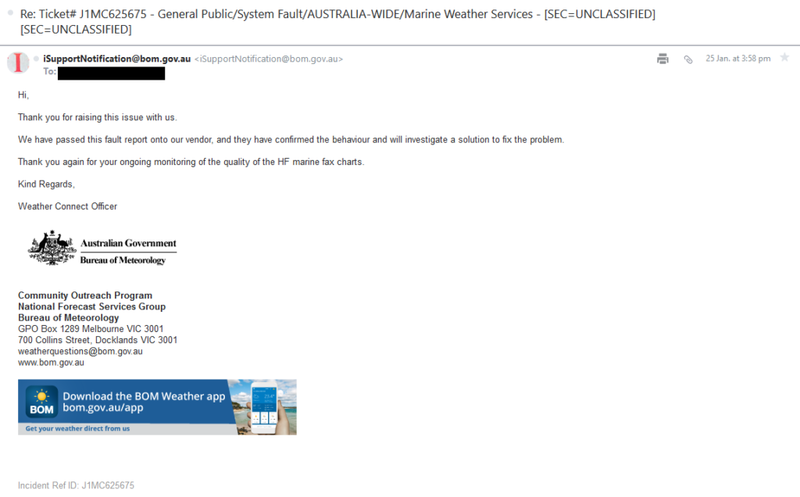 This was official confirmation that BMF was no longer and there would be no good reason to chase their signals. As a result, being a good citizen, I tried to contact NWS/NOAA about this to update the radiofacsimile schedule they publish but … alas, I was foiled by Donald Trump. The US government shutdown meant that they were not processing e-mails at this time, so my amendments would have to wait. 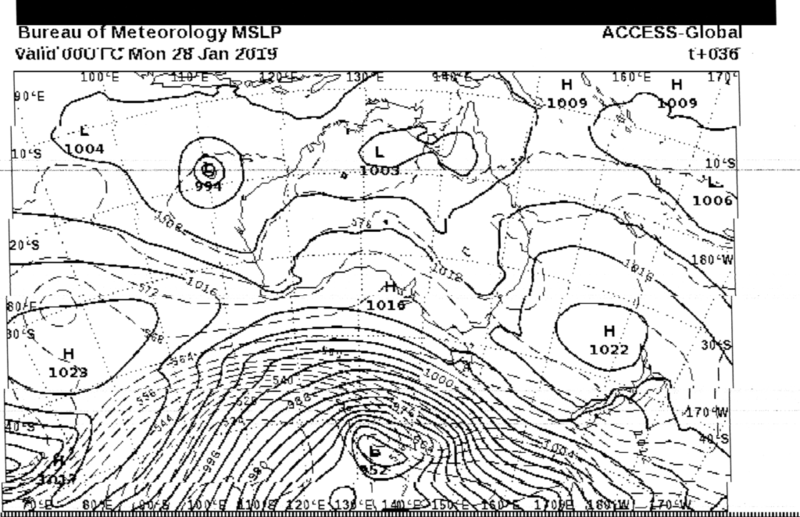 Of course, since then, I had a few other discoveries worth relaying to the NWS, but I’ll wait until this one is sorted first. While monitoring different stations, my first thought is always not to monitor the “home” system – after all, it’s the one your country operates so you just expect it to be working and plodding along in the “same old fashion” because you hear the signal on the air so frequently. Well, in my case, I assumed that until I actually went to monitor the broadcasts. Then, I found something strange was happening. To illustrate this, I’ve got some chart examples although some come from after reporting the fault. 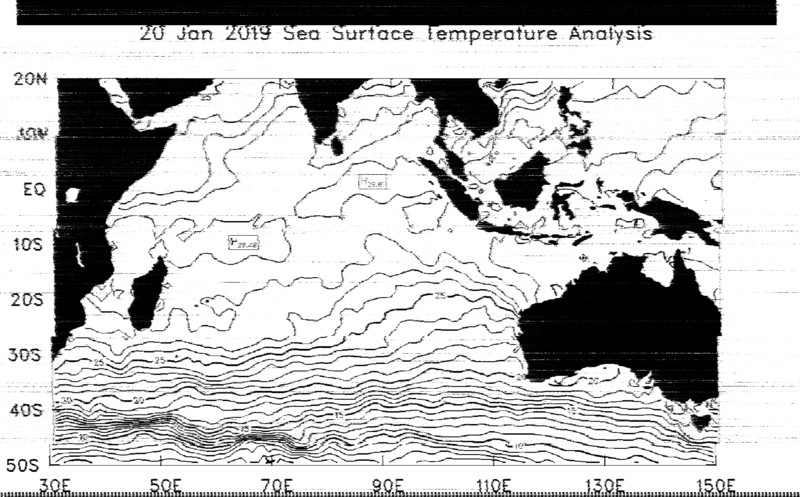 0530UTC unscheduled test chart on 11030kHz on 26th January 2019 is probably the easiest illustration of the issue. Notice how the chart periodically loses phase alignment and “jumps”. You might think this is a fault with my reception equipment and its timing reference – in fact, I thought it was my own fault. So I fired up a few kiwifax.py instances instead while comparing with my sound card Fldigi set-up at home. The top chart (0815UTC) with a jump comes from 5100kHz, but the bottom two are from 11030kHz and has no visible jump. Alas, the devil is in the details, as the jump appears inside the white portion of the chart! And yes, there are still instances where the scheduled chart is not available. At 0330UTC, it was clear that even this chart does get affected by phase jumps on 11030kHz. Note the black spot in the chart is on the original. I asked myself what was going on and was it system-wide? So I ran an experiment receiving the chart from our sister station (as we transmit from VMC Charleville, QLD and VMW Wiluna, WA simultaneously). 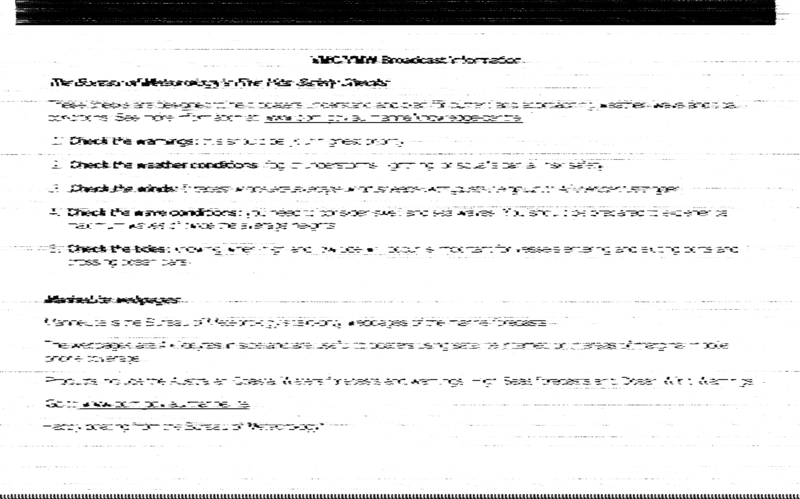 The top and bottom charts are from VMC on 5100kHz and 11030kHz with the middle from VMW on 7535kHz. 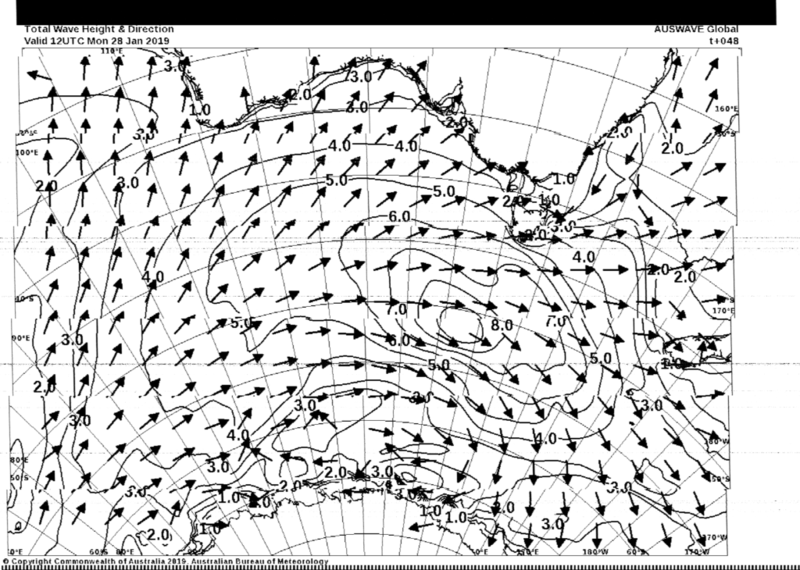 Notice the same chart at 1400UTC received with phase jumps from both VMC and VMW. More interestingly is that the phase jumps on all three frequencies are uncorrelated – the exact point where it “jumps” is not consistent. 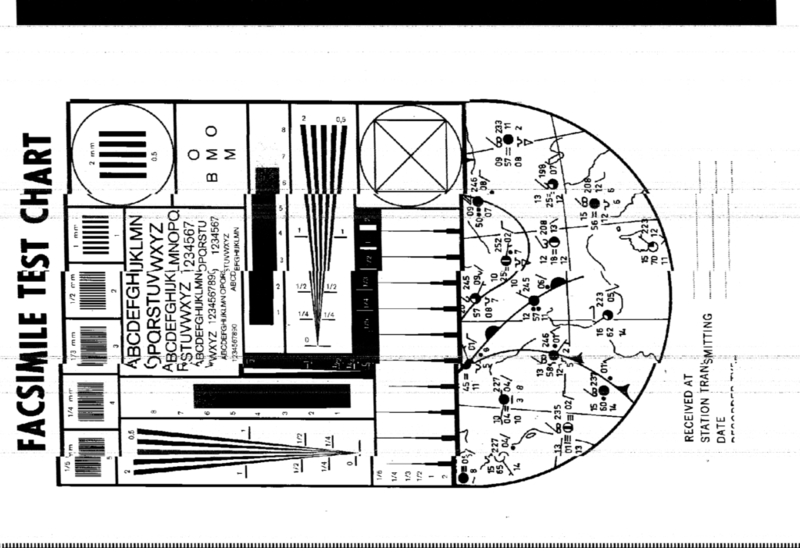 That is rather fascinating and points to some potential failure in the distribution system/clocking of the encoders. The smoking gun was when I compared the same-frequency charts to the one received at home on my own equipment and the phase jumps sit at exactly the same location. This was not a fault in my equipment. 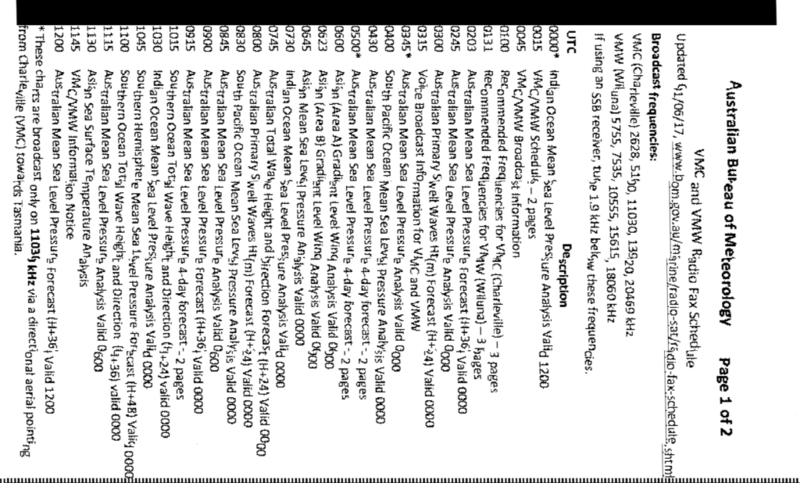 Above is a collection of some particularly low-resolution faxes affected by the phase jumps. 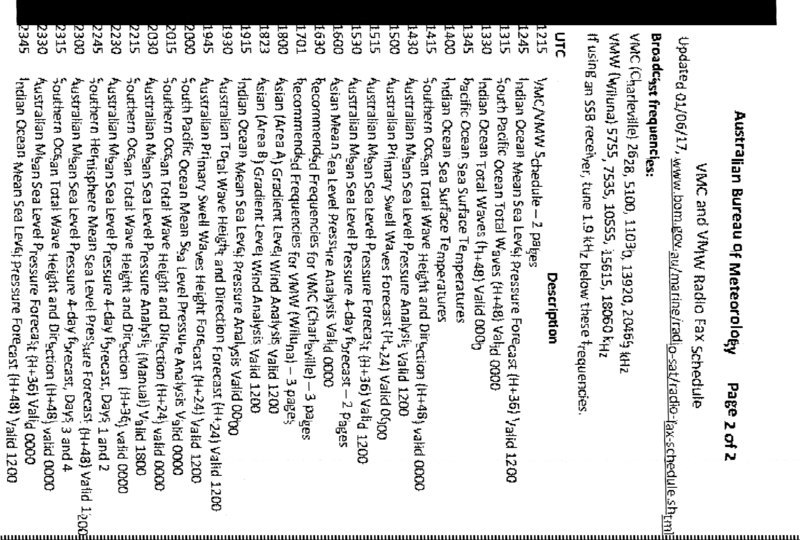 Interestingly, I don’t remember seeing such poor resolution faxes from VMC/VMW in the past. Normally, they look more like the chart below. I hope VMC/VMW returns to proper operation in the near future. In the meantime, if you’re getting some strange jumps in your chart from VMC/VMW – that’s not your fault. 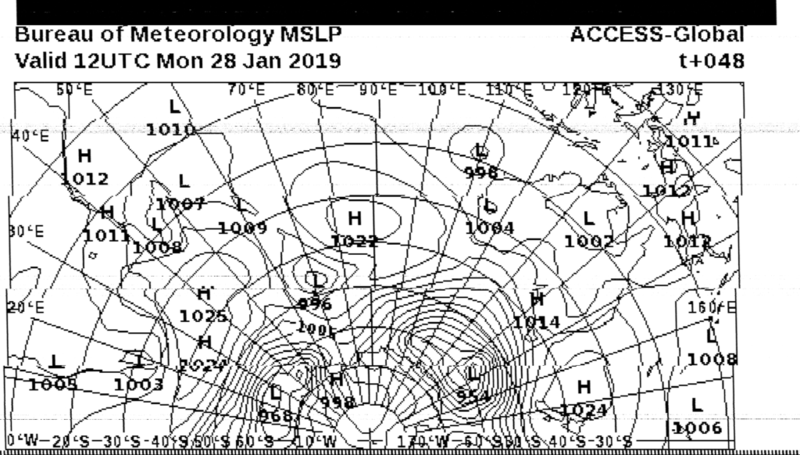 Unfortunately, while a number of stations are listed in the NWS/NOAA Radiofax Schedules guide and the WMO Weather Reporting Transmission Programs Volume C2, whether the stations remain active or not is something that we don’t often know for sure. As a result, I’ve compiled a list of the stations I know about with the activity status based on my recent monitoring efforts over the December 2018 to January 2019 period. As a good number of the stations have never been heard personally (from home), I’m not certain if they have been off the air for a while or whether the receivers I’ve chosen are not sensitive enough or in the right location to receive their signals. In the case of some stations, their frequency and location makes it very difficult to receive the signal unless you are within their coverage area at sea. Other stations may be alive, but due to seasonal operation, may not be sending faxes at this time. Stations which are reported inactive on the schedule have been bolded, along with BMF which I have confirmed to be inactive. A good number of the stations are alive and well, which is good to see. It remains to be seen how many of these stations will remain over the next few years as transmission equipment wears out, spare parts become difficult to obtain and newer modes of dissemination gain favour. The radiofax monitoring effort has not come to an end just yet, but it’s good to take stock of just how many stations there are (to my knowledge anyhow), how many are active based on my own monitoring, and how many have their charts documented and preserved. It’s a shame to see BMF confirmed off-air, but that will likely be the fate of all the listed stations eventually. The fault with VMC/VMW may have existed for a while, but was not noticed as I wasn’t actively checking their service on a continual basis. Regardless, I hope VMC and VMW return to proper operation soon. There is still a number of stations which I have heard alive and well which I have not published an article about – it is my intention to do so in the near future. However, it does take some effort to co-ordinate attempts at reception, sift through charts to find the cleanest copies, weed out duplicates, fix “chopped” charts, merge in sound-card decodes from other sources (e.g. holiday recordings, decoding at home). Regardless, the stations marked alive and well have at least produced one image for me in 2019 – those that are marked unknown or seasonal have been monitored but not heard. The reasons could be down to poor receiver choice (of WebSDRs), poor propagation or station off-air, but it is hard to know for sure. So if anyone has any details about these stations – I’d like to know. Leave me a comment and thanks for reading! Hi, nice blog you have here, lots of useful information! 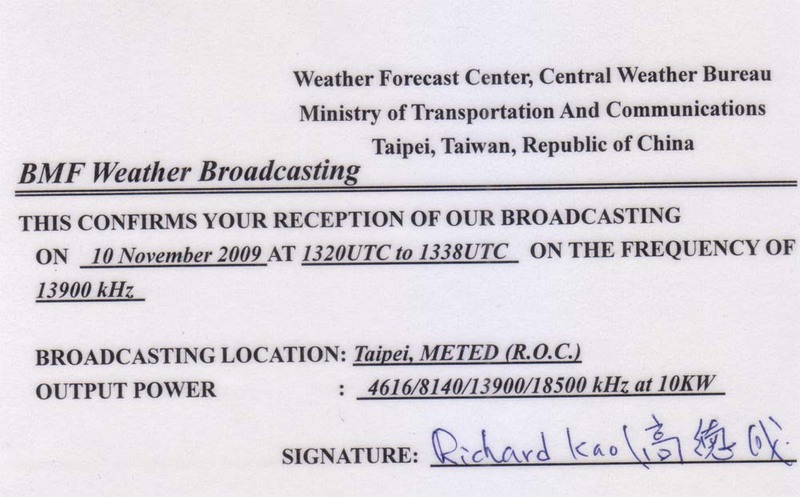 I’m from Belgium, and love monitoring utility station, specially weather faxes. 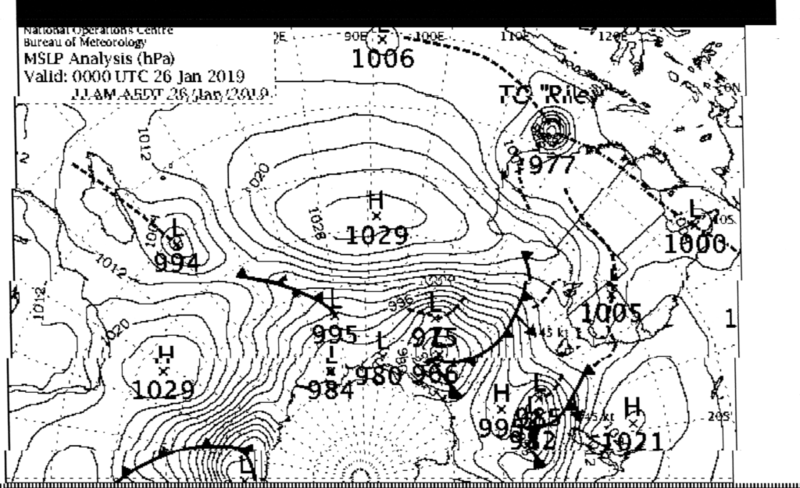 I’m maintaining a web page for my wefax catches (all from my QTH), and I can confirm almost all of your observations. For your information, RBW 41 MURMANSK, RUSSIA, is transmitting again (since September 2018?) at 6328.5 kHz (center frequency), two times a day at between 13.00 and 15.00, and again between 20.00 and 21.00 UTC … they are never very precise with the time schedule. Charts are very bad quality, as their equipment is probably very old. They transmit in LSB so if you use USB you will get a “negative” image. Thanks very much Vitor for the information. I now know to go looking for RBW 41 :). It is especially hard to know when there is not much information online. Glad to see someone else is interested in radiofax/weatherfax. I will continue to post a few more receptions when I have the time – it takes a lot of time to sort out the faxes and find good examples of each.